Thinking of adding a rooftop or vertical garden to complement your New Tech Wood deck or screens and need drainage cells or other landscape water management products? Our parent company Urban Direct Wholesale supplies the Atlantis brand of water management products. 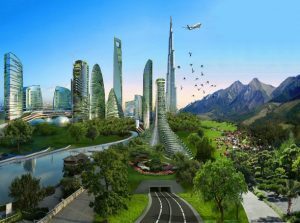 Atlantis is the leading international provider of water management and greening city solutions. Their mission is to create sustainable urban designs turning major environmental problems into assets. 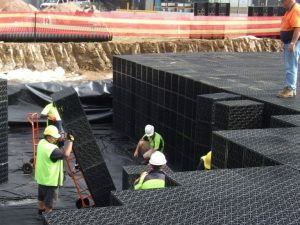 Many architects and engineers specify Atlantis drainage products for a variety of uses, such as road and sports field drainage, leachate collection and flood mitigation, car parks, subdivision development, stormwater harvesting, onsite detention tanks and infiltration tanks, to name some. Many landscape architects also specify Atlantis vertical garden products and drainage systems for roof gardens and vertical garden applications for commercial and residential projects. 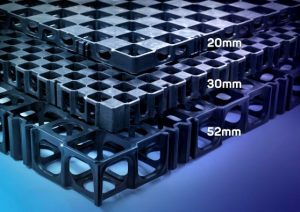 Take the Atlantis Flo-Cell, for example, a permeable drainage product suited to any subsurface filtration application, ranging from planter boxes and roof gardens through to roads and railways. It comes in three sizes: 20mm, 30mm and 52mm. With an efficient modular design, they can be joined together to form scalable areas from small backyards to large civil projects. 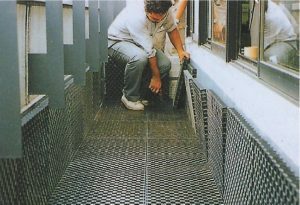 Rapid Drainage – it efficiently drains excess water while retaining optimum moisture levels, which is the perfect solution for planter boxes and roof garden applications. Lightweight – Definitely don’t need cranes or specialised lifting equipment. Strong Structural Design, engineered for use in drainage-critical applications. Versatile – The Flo-Cells can be installed horizontally or vertically and are easily configured to meet project specifications. High Infiltration – 90% void ratio. Biological and chemical resistance to contaminants. As the original inventors, Atlantis have been around the longest and have accumulated more knowledge, experience and expertise, as shown in the quality and versatility of their products. Quality Control – Atlantis pre-test ALL batches – they don’t just do random testing – and tests are done according to ASTM D1621 Standard test method for compression properties of rigid cellular plastics. This guarantees their quality is both assured and predictable. They can meet demands with dozens of stockists and offices worldwide and Australia wide. They offer engineering support (before, during and after) – design life calculations, design support and installation support – all just a phone call away. This provides you with streamlined project flow from consultancy through to design and installation. 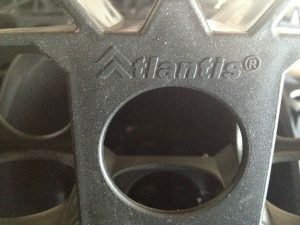 How Can You Tell the Real Atlantis Product from an Imitation? You can tell authentic Atlantis Flo-Cells by the patented diamond pattern – the only flo-cell that has it and which provides the extra strength. You can also tell you have authentic Atlantis products by looking for the Atlantis trademark which is imprinted on every piece. To find out more about solutions for rooftop gardening challenges or incorporating New Tech Wood decking and screening into your urban oasis, contact the team at New Tech Wood today.